I couldn’t help myself. I saw the leftover yarn sitting there, and it called my name. Knitted Wit’s Polwarth Wool/silk DK blend is so lovely to knit with; I couldn’t walk away! I’m glad I gave in. The hat is so cute, and will fit sizes 2-4T. As you can see from the pictures, we checked! 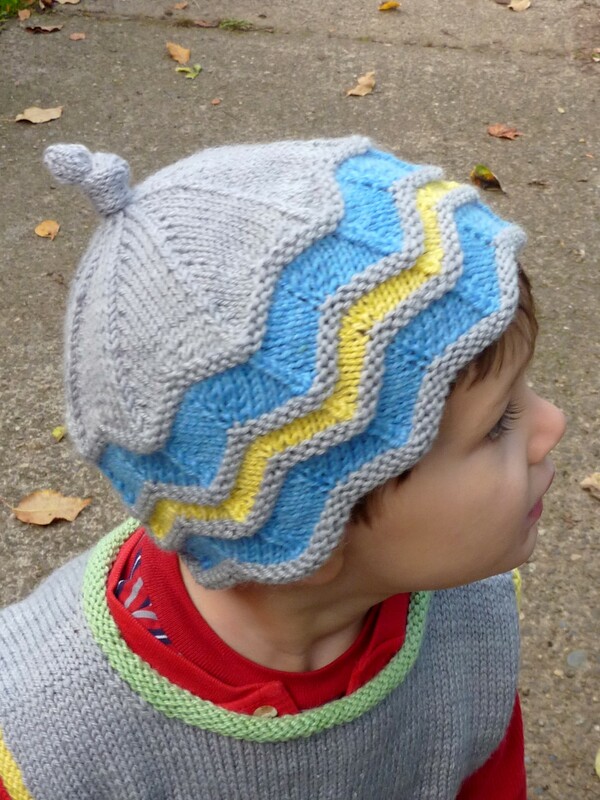 I’ve amended the Ravelry version of This Little Ziggy to include the hat. The price of the pattern is now $6 because it includes vest and hat, but if you use the coupon code “ziggiest” at checkout before November 7, the pattern is $2 off, which takes it back to the pre-hat price of $4 (but includes the hat). The simplest way to do this is to use this link, and the code will be applied for you. The KnitPicks version will sell for $3.99, but the hat pattern is not included in that version, since I’ve already sent it off for publication. I’ll let you know when that goes live, too. To hat, or not to hat? That is the question! And do you want a separate pattern for just the hat? I can make that happen, too! 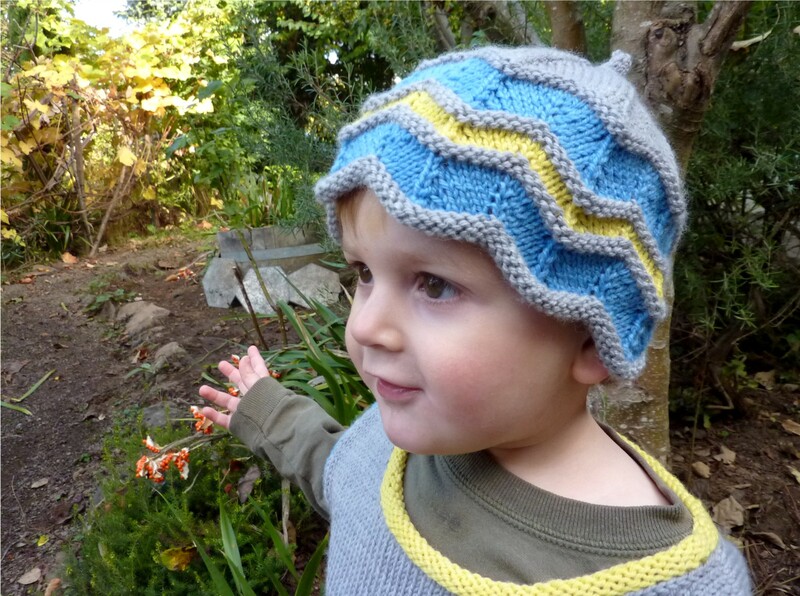 This entry was posted in Knit, pattern design and tagged This Little Ziggy, ziggy hat. Bookmark the permalink. Love the little ziggy hat and vest. Thanks for the offering the coupon code. The hat is really cute! I love the pattern and how you break it up with the garter ridges. Very nice! Your little sweater is also adorable. Too darn cute. Love the use of popping yellow. it’s what makes this special besides the awesome model. Another wonderful design. What’s next? I love that popping yellow, too, and it’s just enough at half height. I was going to make it as tall as the blue, but I ran out of yellow because I used it on both of the boys’ vests! But I think it looks better short, so I kept it that way for the pattern. Next design is charted out but I can’t knit it this week. I need something more appropriate for multi-tasking, so I just may knit that red Annis after all. Received my Knit Picks catalog today, and I was so happy to see your photo and design! Congrats!